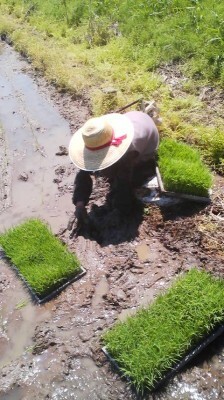 These days, with all the modern machinery and know-how, young people growing up in rice-farming families have it easy. They have know idea how much time we had to spend or what back breaking labor we had to endure to finally reap in our crop of rice. Yes , its hard for my grandkids to try and understand what life was like when I, their old granny, was a young girl. They certainly could not imagine what things were like back in the days when MY OWN granny was young. Every year, when the the sparrows come back to our neighborhood to ready their nests and the water is being released into the rice fields- turning our little village into what looks like an island in the middle of a lake- I can`t help but remember a story which was told to us children by our mothers and grandmothers- and a scary story it was, too! You see, way back when, there were certain rice fields which were FUKANBO*. Now these days I dont reckon that there are any of them anymore, and most young people have probably never even heard the word. So, let me tell you then just what a FUKANBO is. It`s a bottomless rice field- a man-eater, a horse-swallower, an ox-obliterator- an abbyss. When someone or something got sucked down into the mud in one of them while plowing or transplanting they were never seen or heard from again. Now right here in our village there was a family whose paddy field was a FUKANBO. Still they were able to grow rice in it every year by using long planks as stepping boards laid out across it when it was flooded. But, as you could imagine, the first son of the family which owned that field had a very hard time finding anyone willing to be his bride. To everyone`s surprise, though, in the end he did- and a beautiful and kind-hearted young woman she was, too. The husband`s love and affection for his new bride, made his mother extremely jealous ( as you can imagine), and even more than was the usual case back then, the mother-in-law bullied her daughter-in-law and gave her no rest from torment or from long and hard work. Still, each night the young wife would find consolation in the kindness of her loving husband, who always listened to her with a sympathetic ear. When spring came around things became extremely busy for the whole family ( and for the rest of the village) as preparations were made to transplant the rice seedlings. But more than anyone, it was the young daughter-in-law, under the supervision of her mother-in-law, who had to bear the greatest burdens of the work. When their field, the FUKANBO, was ready for the seedlings, the planks were set so that the very deep and soft mud could be walked across. The family worked late into the evening, but still the job was not completed. Exhausted, the mother-in-law announced that she would be calling it a day and that her daughter-in-law should stay on until the transpalntation was finished. As the sun set, the terrified young woman worked through her weariness, and while bent over with face near the flooded field`s water surface she tried to catch a glimpse of her husband, who she hoped would come to the rescue and take her back home. Little did she know that her husband, himself worn out by the day`s work, was already back at home soaking in the bath. It got darker and darker. The husband, warmed and soothed by the hot waters, got out of the tub and into his futon. He soon fell into a deep sleep. When he woke up the next morning, he realized that his wife had not come home. In a crazed panic he rushed out and ran to the FUKANBO. He dropped to his knees in grief when he saw, there in the middle of that terrible field, floating in the water- all that remained of his wife: her straw hat! For year`s after , each spring when that field was filled with rows of young rice plants, the spot at which the young bride had been lost in the mud was left unplanted. A terrifying empty brown square in a sea of green- a reminder of the terrible thing that happened. * The word FUKANBO is a blending of two Japanese words- FUKAI (深い), deep- and TAMBO (田んぼ) rice field.